The creative team behind the new graphic novel World War Kaiju joins us for this week’s show! We talk about the cultural moment of kaiju, living in San Diego during Comic-Con, the best Godzilla monsters, replacing the atomic bomb, and much more! Plus, a podcastual installment of the War Rocket Ajax Love Haters! Check out the World War Kaiju Kickstarter and contribute! Take a look at this huge list of Godzilla monsters! Here’s that Comedians in Cars Getting Coffee show Matt mentioned. Sims was away at Comic-Con this week, but we’re still doing a big old show with Chris Haley of the Gravity Falls Gossiper podcast and Let’s Be Friends Again! He and Matt tear down the format of the show to have a freewheelin’ conversation about impressions, Bill Hader, wrestling (more than you would ever think), art in comics, whether box office should matter for movie fans, game shows, comic convention crowds, and a lot more! Not discussed (at length): Connecticon and Van Halen, even though we say we’re getting to those. Plus, Sims does check in from the con! Follow Chris Haley on Twitter and Tumblr! While you’re at it, go check out the Gravity Falls Gossiper if you haven’t! Buy a t-shirt! If you’re not familiar, here are the theme songs to Raw, Smackdown, Main Event and NXT. Chris was on an episode of MTV’s “Fanatic.” He sang on stage with Van Halen. Life dream dropper over here. Next time you read a comic, admire that art! Tom Fowler, artist of the brand new Valiant Comics series Quantum and Woody, joins us for the show this week! We talk about comics critics and what they say about art, playing D & D, penises, “acting” in comic art, Golden Corral, and much more! Plus, a hip-hop-themed installment of the War Rocket Ajax Love Haters! Follow Tom on Twitter and be sure to check out his Tumblr! Here’s Tom’s D&D Tumblr, too! Take a look at Declan Shalvey’s comment about comic art and reviews. Shockingly, a few Ponderosa steakhouses still exist. All Matt’s Soda Shaq taste tests, in one place! Check out The Abettor’s Letters, and donate to it on Kickstarter! The artist behind Archaia’s new re-imagining of Cyborg 009, Marcus To, joins us this week to talk about adapting a classic manga, “Thor buttons,” cyborg babies, Tim Drake, the best cyborgs of all time, and, of course, hairstyles. Also, a Comic-Con-related listener question! Follow Marcus on Twitter and be sure to check out his Tumblr! You can watch the first episode of the 2001 Cyborg 009 anime on YouTube (at least for now). 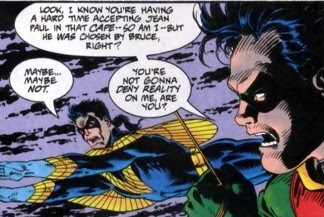 Behold the beauty of the 1990s Tim Drake Robin costume. Also Nightwing with a ponytail. Over on our other podcast, Movie Fighters, we’ve wrapped up our first series of movies, which were all based on fighting games! In honor of Monkeybrain Comics’ first anniversary, co-publishers Chris Roberson and Allison Baker are our guests this week! We reflect on Monkeybrain’s beginnings, discuss knowing your limits, talk Eisner nominations, dream about creative teams, do Danzig impressions, fawn about Kurt Schaffenberger, and more! Follow Chris, Allison and Monkeybrain on Twitter! Monkeybrain has a panel at San Diego Comic-Con, Thursday night at 8! Go if you’re going to be in San Diego! Kurt Schaffenberger’s cover to Superman’s Girl Friend Lois Lane #79 is amazing.